Below read a submission from guest writer and historian, Brian McCallan. 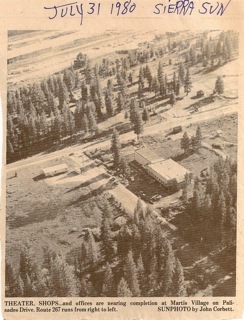 Brian had contacted TDHS during his research of the old movie houses in Truckee . . . read the results of his findings. Some content contained in this article came from the historical archives of the Truckee Donner Historical Society. 10115 Donner Trail Road, Truckee, CA. Call 530.582.0893 for hours of operation. For more information about our archives and artifacts email info@truckeehistory.org. Truckee movie lovers will always seek out the recent releases of favorite stars and directors, and up until a few years ago, residents could enjoy this historic entertainment activity without leaving their hometown. In the 1950s and 1960s the Donner Theatre was located toward the west end of Commercial Row on an elevated lot. Former Truckee resident Barbara (Arnett) McCallen remembers the theater as being "really old, and it had a little tiny entryway." The entryway was where Arnett bought her movie tickets. Inside the small theater, the seating was cramped. The screen hung above a stage, hidden behind a curved curtain that was opened just before show time. 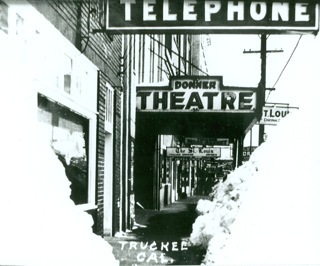 The Truckee Donner Historical Society (TDHS) states that the Donner Theatre opened in 1919 and showed films for 45 years until the movie house burned down in December 1964. Another even earlier movie house in town was in the upstairs area of the Capitol building, which was built in 1870. In the 1870s, the lower level housed a bar known as Hurd's Saloon; live entertainment was offered upstairs on stage. From the 1920s through the 1930s, silent films were shown in the upstairs portion. Chaun Owens-Mortier, a research historian at the Truckee Donner Historical Society, shared her memories of this theater, "Actually I've seen live stage productions in the Capitol. It was a very comfortable, small venue, which added to its flavor." By the 1970s, the community interest in films had faded and The Capitol Theater featured live music instead. In 1993, The Capitol Theater became a site for live stage productions. Another one of Truckee's movie theaters was The Paramount built in 1909. 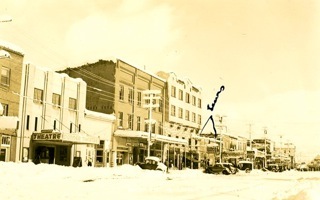 The Truckee Donner Historical Society says that The Paramount was located on the first floor of the former Masonic building on 10068 Donner Pass Road in the hub of downtown. The Masons rented out the first floor for movie showing. The theater stayed in business from the 1920s through the 1930s. In 1993, a propane leak explosion destroyed the Masonic building. Most present-day Truckee residents remember the small Martis Village Theater, which operated from 1974 until 2006.Truckee Town Manager Tony Lashbrook describes the theater as having been a one-screen movie house located in the Martis Village strip mall. Owens-Mortier describes her experience at Truckee's last movie theater, "The Martis Village was also small but comfortable. I think the size of the venue adds to its flavor as you can feel as though you are a part of the movie or production. More like a family night at home than a bigger type situation." North Shore Theatres operated this sole movie screen in Truckee until its closure in 2006. Owens-Mortier says that many residents miss the Martis Village Theater because they liked the fact that Truckee had its own movie house. She also commented that Truckee's movie theaters yesterday and today provided entertainment to a booming town during tourist times and during the town's quieter seasons of spring and fall. After three years without a movie theater, Truckee residents have a glimmer of hope for the return of this family attraction. Lashbrook confirmed that the new Truckee Railyard Plan calls for a movie theater, in addition to loft style housing, lodging, and commercial space in the downtown area with the expected result of increasing business for local merchants. The Truckee Hotel front desk clerk, Mary Cruz, explains how the new theater in the Railyard Plan could help boost her business, "We need something . . . that can pull in younger people into Truckee." Old-time Truckee residents fondly remember family times at a local theater, and many current merchants support the Railyard Plan for a new theater. Perhaps soon the smell of popcorn will waft among long lines of excited families or couples on their first dates at a new downtown Truckee movie theater. Brian McCallen is a resident of Livermore, California, and Truckee.